Ultrasonic investigation is an established non-destructive testing method for detection of defects and material characterisation. In the last years scanning ultrasonic echo methods were developed especially for the application in civil engineering. The different scanning ultrasonic echo methods are modified with respect to the type of the transducer applied, the number and the arrangement of transducers and the frequency used. Also different algorithms are used to analyse the measured data, for instance SAFT (Synthetic Aperture Focusing Technique) reconstruction. The results are typically presented as B- and C-scans, obtained from raw data or the SAFT reconstructed data. Since 2001 several German research institutes co-operate within the scope of the research initiative Non-destructive Evaluation of Concrete Structures Using Acoustic and Electromagnetic Echo-Methods (FOR 384) supported by the Deutsche Forschungsgemeinschaft (DFG). One of the tasks is to investigate these ultrasonic echo methods for special applications like the detection of cavities in concrete structures or faults in tendon ducts. Concrete test specimens with intentional faults have been manufactured and investigated. Parameters were defined to assess the results more objectively. Currently three parameters -signal/noise-ratio, lateral edge resolution and uniformity- are considered. For the first time results of different working groups on the same imaged objects are compared quantitatively. It should help to get more knowledge about the ultrasonic inspection of typical faults in civil engineering structures. For the detection of irregularities in concrete elements like cavities and honeycombing and for investigations of tendon ducts the ultrasonic echo pulse technique is used. Transmitter and receiver are arranged on the same side of the concrete test object. The transmitted pulses are reflected at objects embedded in concrete and are detected directly by a receiving transducer. The changes in the transmitting time and the amplitudes of the reflected pulses are used for analysis. Concrete is a very inhomogeneous material. In contrast to metal the texture of cement matrix, aggregates and pores - in a wide range of size - leads to far more scattering attenuating the transmitted pulse. Transmitter signals of low frequencies in the range of 50 kHz - 500 kHz are used to reduce the influence of scattering. The research initiative applied five different measurement systems. The signal information is collected within a synthetic aperture with broadband transducers. The chosen transmitted centre frequencies reach from 55 kHz to 200 kHz. Before the ultrasonic signals are converted to colour or shades of grey images, they have been reconstructed by using SAFT algorithm in most of the cases. Up to now the evaluation of the measurement results depends more or less on subjective criteria, given by the operators. Mainly qualitative statements, which based on the produced images, can be made. Aim of the research initiative is to define parameters that allow a more objective assessment. MFPA Weimar uses a linear aperture. One longitudinal wave transducer is moved along a line (linear aperture) with a regular spacing of typically 10 mm. The detected pulses are reconstructed with 2D-SAFT. As a result, SAFT-B-scans show a section through the material along the aperture length and the test depth [Ref 1]. BAM Berlin uses the method of planar aperture. The pulse transmitting has been realised with longitudinal wave transducers of a regular step width of 20 mm. The three available measurement systems differ by the arrangement of transducers and the kind of scanning: 1. A pair of transducers moved along a grid (SE-Technique), 2.Planar ultrasonic array with ten transducers moved along diverse close-by lines (Array-Technique) and 3. Field scanning by laser-Doppler-interferometer. In cooperation with IZfP Saarbrücken the received signals are processed using 3D-SAFT. The 3D-data fields can be displayed as B-scans (x- depth z- or y- depth z-projections) or C-scans (x- y-projections). The projections into an image are selective summations over the remaining coordinate [Ref 2, Ref 4, Ref 6]. To take into account the development in the last years measurement systems with transversal wave transducers in point contact have been used for investigations too. TU Darmstadt applies a low frequency flaw detector A1220, manufactured by MSIA Spectrum, Moscow [Ref 11]. The reflected pulse signals are collected during moving the detector in a planar field with regular space of normally 20 mm. The device produces a three dimensional data field and allows the display of B-scans (images coordinated of lateral scanning position and depth) and C-scans (images with planar coordinates in a defined depth) [Ref 7]. BAM Berlin uses the transducer unit of this detector, too. But the transmitting of the pulse and the acquisition of the reflected pulses happen in the same way as the sending and receiving of signals at the planar apertures with longitudinal wave transducers. The measurement data are also reconstructed with 3D-SAFT. At first the discussions about the parameters for the quantitative assessment were based on measurement results, which were gained using several of the available ultrasonic systems for the same testing objects. Especially measurement results performed for investigations of tendon ducts at three concrete test specimens are used. The test specimens, two manufactured by Technical University Darmstadt and one by BAM Berlin, contain tendon ducts and drilled holes. Additionally concrete test specimens were constructed by MFPA and BAM to obtain research results about the resolution characteristics. The applied measurement systems for these investigations and also the used centre frequencies are listed in table 1. Table 1: Applied measurement systems and centre frequencies. The types of data fields and also the possibilities of imaging depend on the ultrasonic systems. And even for the same objects the result images differ partly considerable from each other. 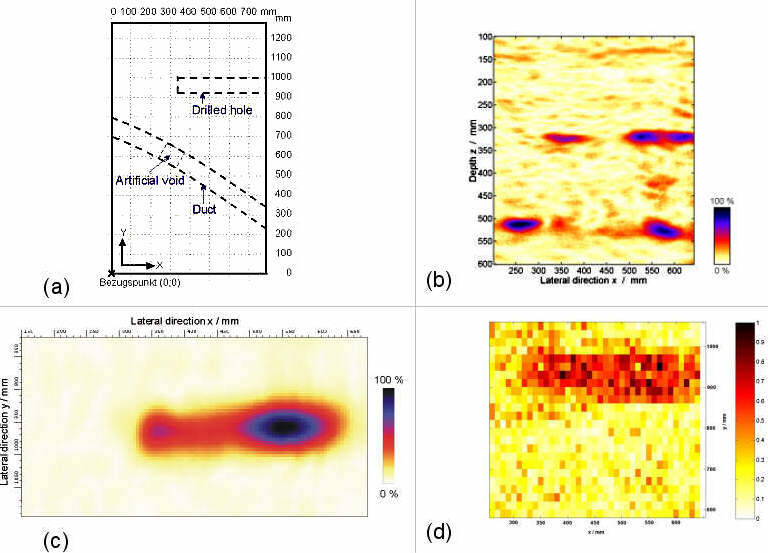 Fig 1: (a) Test specimen containing a drilled hole and a tendon duct with artificial void; (b) - (d) ultrasonic images of the drilled hole: (b) SAFT-B-Scan of Linear aperture, (c) SAFT-C-scan-projection of Array 85 in a depth range from 306 mm to 328 mm, (d) C-Scan of A1220 in the depth of 306 mm. As an example an area of one investigated test specimen is pictured in figure 1(a). The thickness of this specimen is 50 cm. The drilled hole and also the tendon duct run parallel to the apertures with a concrete cover of 31,5 cm. In figure 1(b), 1(c) and 1(d) typical images of the measurement systems (Linear aperture, Array 85 and A1220) are shown. The scans were made about the drilled hole that has a diameter of 80mm and spans from the right edge of specimen to x-coordinate of 340 mm. The results of the Linear aperture are displayed as B-scan and present a section through the hole vertical to the measurement surface. For the other two measurement systems different sections in the lateral directions at the depth of the hole are imaged. In each of the scans the irregular trend of the amplitude values above the vertex of the drilled hole is approximately the same. Differences in the imaging quality exist. And at least the detection of the hole borders by means of these images is difficult to date and depends more or less on subjective criteria. This aspect plays yet a greater role for the investigation of different filled tendon ducts or of the detection of flaws in ducts for instance, where the measured amplitude values should deliver information about the kind of filling. And a more objective way for the image interpretation must be found. This is also useful for the targeted systematic comparison of different ultrasonic imaging with the aim to get more knowledge for their applications. In cooperation the members working on the ultrasonic work package in the research group FOR 384 picked up three parameters for the evaluation of ultrasonic images: the ratio between the measured noise- and object amplitudes, the lateral resolution and the uniformity of the images in respect to the testing objects. The definitions of the parameters should allow an easy application to the measured data. For the discussion of these parameters it is necessary to find practicable thresholds for the description of the detected object range and the determination of the distance between the measurement aperture and the detected object, concrete cover. And of course these thresholds and also the opted range of noise influence more or less the parameters for the quantitative evaluation. These formulas were developed according to definitions used for common applications of ultrasonic metal testing. The first definition encloses all amplitudes greater than or equal to the half of the maximum of all object amplitudes. The second definition considers all amplitudes greater than or equal to the double of the effective noise value as belonging to the object. The effective noise value has to be calculated from the noise values between the aperture and the object amplitudes in B-scans or from the noise values of a representative area besides the objective amplitudes in the C-scans. 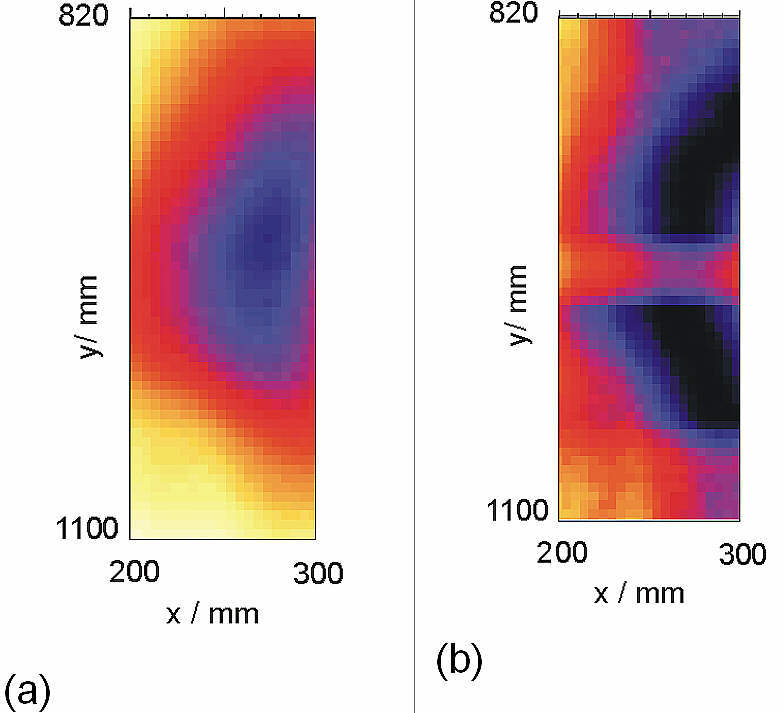 Figure 2(a) and 2(b) show the same B-scan-projection from the drilled hole of the specimen in figure 1(a). The object amplitudes resulting from the two different thresholds are marked as vertical lines. In the case of the threshold bom most of the enveloped signals can be allocated to the real test object. Otherwise a wide range of the drilled hole is determined as noise. By application of the threshold boe, resulting from the noise values between the aperture and the object amplitudes the range of object amplitudes is larger than the size of the real object. The results of the ultrasonic systems from BAM Berlin show almost the same effect for this object. Also investigations of amplitude statistics by Weibull- and Gaussian distribution led to a special threshold - bop. It is equivalent to the amplitude value at one percent of the false alarm probability. In figure 3 the results for the drilled hole mentioned before are presented. The basic ideas and applications are described in [5,9,10]. In this way the influence of the thresholds on the signal/noise-ratio is minimised and it allows an easy and realistic comparison of the ultrasonic results. The resolution following the classic definition is defined as the displacement of two small objects to each other where the object amplitudes are 6 dB lower than their maxima and the objects do not influence each other. MFPA Weimar has performed investigations of the lateral and axial resolution. For that purpose concrete test specimens with embedded small objects were manufactured. The -6 dB width of the amplitude function in lateral respectively axial direction can be used as evaluation criteria for the resolution. The objects to be detected in civil engineering constructions are normally large like tendon ducts and drilled holes. So the common resolution is not applicable and it was necessary to find a way to describe the resolution of ultrasonic results on concrete structures. For that purpose the edges of the detected objects are considered. The resolution is to determine at the rising flank where the threshold boe is crossing. Two models of the lateral edge resolution were discussed. First the edge resolution results as the width between the 10 % - and the 90%-amplitude value of the slope in consideration of the effective noise value [Ref 8]. The application on examples had shown that the 10% amplitude value goes far into the noise range. At the second model the lateral edge resolution dKl is defined as the width between the amplitude slope maximum oFmax and the amplitude of 6 dB less. As an advantage of this model the noise does not influence these parameters so much. For the comparison of the different ultrasonic measurement systems on the same object the edge resolution has to be determined along the lateral line plot(x) which includes the maximum of all object amplitudes omax. Fig 4: Determined lateral edge resolution for Array 150 above the drilled hole (see figure 1(a)). In figure 4 the determined lateral edge resolution obtained from the array measurements with a centre frequency of 150 kHz above the end of the drilled hole (see figure 1(a)) is pictured. For the evaluation of the uniformity all amplitudes greater than or equal the threshold boe (see equation (2)) are taken into account. Actually a definition of uniformity is in discussion where all object amplitudes are averaged considering each x (largest lateral dimensions) along the depth range of object. The lateral uniformity glx is defined as the ratio of those averages and the standard deviation. In that way the distribution of amplitudes dependent on the dimensions in lateral direction and also dependent on the depth are considered. In the figure 5(a) the distribution of all object amplitudes and in the figure 5(b) the averages for the tendon duct at the specimen in figure 1(a) are diagrammed based on the measurement data of the Linear aperture. Whereas the histogram of the averages is comparable with the Gaussian distribution, the histogram of all object amplitudes does not follow those criteria. Fig 5: (a) Histogram of all object amplitudes oik, (b) Histogram of the averages of the tendon duct at specimen in figure 1(a), based on measurement data of Linear aperture. By using the planar measurement systems the second lateral direction y has to be regarded. Previous tests demonstrated that the dimensions of the object amplitudes in this direction have a great influence on the value of uniformity. This effect has still to be discussed. At present the comparison of the measurement systems, especially 2D- and 3D-data, are performed according to the mentioned definition and the averaging of all uniformities glx following the y-direction. The determination of the parameters for the 3D-data fields can result from B-scans (x-z or y-z-projections) or C-scans (x-y-projections). For 2D-SAFT-data set C-Scans do not exist. For the time being the parameters of simple objects like the drilled hole and non-shield areas of the back wall at the specimen in figure 1(a) are presented. The parameters for these objects were determined for six different ultrasonic measurements. In table 2 the signal/noise ratios and the lateral uniformity's are compiled. The signal/noise ratios rise clearly above the criteria for significance of 6 dB usually used in the ultrasonic pulse technique. It can be seen that the signal/noise-ratio can vary depending on the chosen area for the calculation of the effective noise value. Therefore the information about the considered noise area must be given. Especially the SAFT results of the measurement system SE 150 show a difference between the signal/noise ratios determined for the drilled hole with B- and C-scan. Here the effective noise value in front of the object amplitudes is greater than it is in the depth of the object. Table 2: Signal/noise ratios and lateral uniformities given for the drilled hole and the back wall of the specimen in figure 1(a). The uniformities of the back wall were calculated for areas of it where no objects are located in front of the back wall. As examples for the lateral uniformity the back wall areas of both array measurements are pictured in figure 6(a) and 6(b). The size (100 mm * 250 mm) and also the location of the areas are similar. The lateral uniformities were calculated along the x-axis after the equation 5 in chapter 4.4. The values for Array 85 range from 3,4 to 6,4 and result in an average of 4,9, and the lateral uniformities for Array 150 range from 3,9 to 19,7 and result in an average of 7,3. The applications had shown that the lateral uniformity could vary depending on the size and the location of the chosen back wall area. So the values in table 2 should be regarded as preliminary experimental results, because they derive partly from different back wall areas. For the determination of the third parameter, the lateral edge resolution, the edge on the end of the drilled hole was chosen. The results are shown in table 3. Table 3: Lateral edge resolutions given for end of the drilled hole at the specimen in figure 1(a). For comparison to this the lateral edge resolutions for a second example are presented in table 4. Here the parameters were determined for an edge of a notch on the back wall of a specimen (figure 7), which was especially manufactured for investigations of imaging specificity and resolution characteristics depending on the different measurement systems. The concrete cover above the notches are 20cm and the thickness of the specimen itself is 25 cm. Up to now measurements were performed only by BAM. Fig 7: Specimen for investigations of the specificity of imaging and resolution characteristics. The considered edge is marked. Table 4: Lateral edge resolutions given for the left edge of the 3rd notch at the specimen in figure 7. The lateral edge resolution depends on the depth of the considered edge. For applications at concrete elements the type of concrete, especially the aggregates and pores, also influence the parameter essentially. Of course the design of the considered edge will have an influence on the results of determination and has to be taken into account, too. Parameters were defined in order to assess the results of ultrasonic measurements quantitatively. Currently three parameters - the signal/noise-ratio, the lateral edge resolution and the lateral uniformity are considered. The axial edge resolution should follow analogue the lateral edge resolution. First the parameters were calculated using measurement results of selected investigations, where at the least two measurement systems were applied. The calculated parameters for simple test objects are shown. At present an objective comparison of the different measurement systems based on the parameters would be precipitated. Experiences have to be made with further applications on known objects and also for even more complex testing tasks, like investigations of different filled tendon ducts. Discussions of the applied thresholds will be carried on as well. Additionally the programs for the parameter determination have to be unified and to be improved. After that the parameters will enable the user to get more information for the ultrasonic inspection of concrete structures and to compare systematically the systems of ultrasonic imaging. With the parameters objective criteria will be defined for the optimisation of ultrasonic applications in civil engineering. The authors gratefully acknowledge the support of this study by the Deutsche Forschungsgemeinschaft (German Science Foundation) via grant number FOR384 in the frame of the Forschergruppe (research initiative) "Non-destructive evaluation of concrete structures using acoustic and electro-magnetic echo-methods". Please refer to the websites of this project at http://www.for384.uni-stuttgart.de/ for additional information.